Christmas is just around the corner, but holidaymakers heading to Lapland this year are interested in seeing more than just Father Christmas. 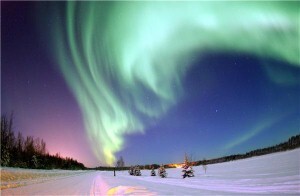 The release of the latest fantasy movie the Golden Compass, based on the novel Northern Lights by Phillip Pullman, has jogged memories and reminded travellers of the stunning sights available across the arctic and sub-arctic. Known as the aurora borealis, or northern lights, this display of stunning colour in the northern sky appears when solar wind particles collide with air molecules in the earth's atmosphere, transferring their energy into light. And now thousands of people are heading up to Sweden, Norway and Finland to see the sights during the winter. But, of course, Father Christmas is still the biggest pull in Lapland. Jon Pearce from holidays-direct website explained: "There is so much to do and see in the day, from seeing Santa's home to going on a reindeer drive, that the experience will stay with you a long time after, for parents and children alike. "And as there is very little day light this time of year, you have a good chance of seeing the Northern Lights too before your Christmas holiday break in Lapland ends." But visitors are heading north this winter are reminded to take out adequate travel insurance if they are planning a trip to see Santa and the Lights for Christmas, in order to cover any expensive gifts they take with them.